Never step outside to turn on the Christmas lights again! As any homeowner knows, a standard outlet won’t work in an outdoor setting, as some level of ruggedization is needed to protect the system from shorting out due to wet weather. That’s especially true for smart outlets, which contain delicate electronics that are at odds with rain, snow, and insects looking for a cozy home. 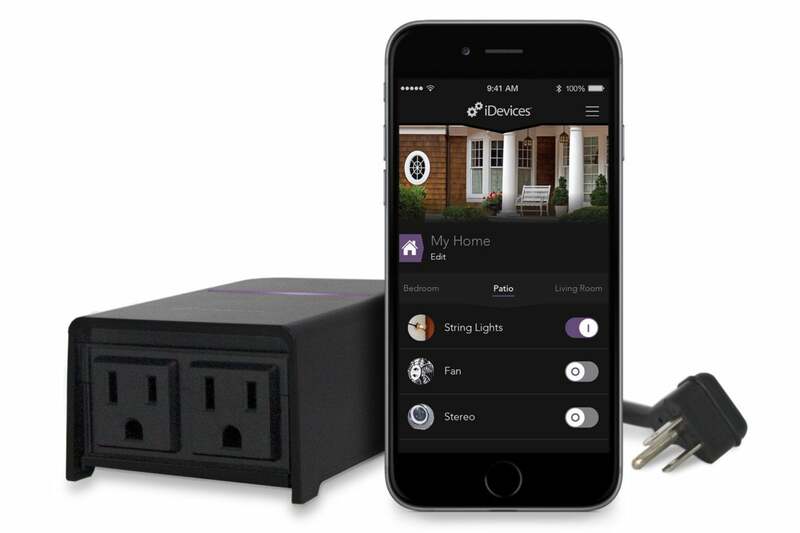 With its Outdoor Switch, smart-home product maker iDevices brings its capable smart outlet into the yard. It’s not the best name for the product, as this is really a plug-in power outlet, not an actual switch (which implies a toggle that’s installed into the wall). Yes, there’s a manual power button on the side that lets you turn the system on and off without using the app, but it’s still an outlet at heart. Like most smart outlets designed for the outdoors, this is a black, ruggedized unit connected to a short pigtail, which you plug into an existing exterior power outlet (you should use a weatherized outlet that has a bubble cover to prevent water from getting into the outlet you plug the Outdoor Switch into). The iDevices Outdoor Switch offers two smart receptacles for you to use, but note that they can’t be controlled independently. They’re treated as a single switch by both the onboard power button and the app—either both are on or both are off. 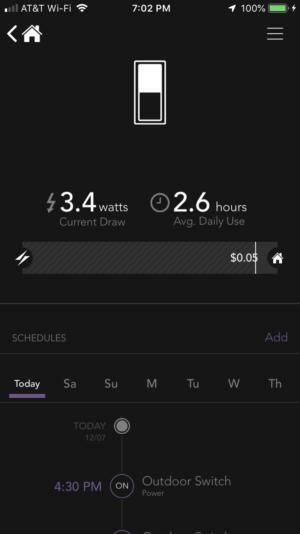 The iDevices app offers energy usage plus scheduling information, all on one screen. Setup is a simple, traditional HomeKit operation (although the switch is not limited to Apple’s ecosystem, it’s compatible with Amazon Alexa and Google Assistant, too). After you plug the switch into wall power, you scan the HomeKit code on the back of the unit or in the Quick Start guide with your phone. After a few minutes of configuration (and mandatory product registration), the device will be available on your network. After I installed the device, a brief firmware update executed, after which I could use the device normally. Once the switch is situated in its semi-permanent location, you are advised to affix it to a wall with an included screw, which keeps the outlets facing downward in a semi-protected fashion. Although iDevices says the switch is “rain-tight” and rugged and has been tested in wet conditions, note that the outlets are not actually covered, so you’ll want to ensure a very tight seal with anything you plug into the socket. From here, operation is much like any iDevices product. The iDevices app is organized into rooms, and if you have a complex environment (since all HomeKit devices appear within the app) this can require a lot of swiping to get to the room you want. Once you do find your room (or the appropriate part of your yard) and the device within it, controls are intuitive, easy, and quick. Don't get too excited: You cannot control the iDevices Outdoor Switch's two receptacles independently—both are either on or off. Turn the system on or off by hand, assign the outlet to a scene, or set schedules as needed. At present, the outlet is handling my outdoor Christmas lights, completely hiccup free despite a significant amount of rain. Energy monitoring features are also built in, so you can see if those LED lights are actually saving you money compared to the old incandescent lights you upgraded from. 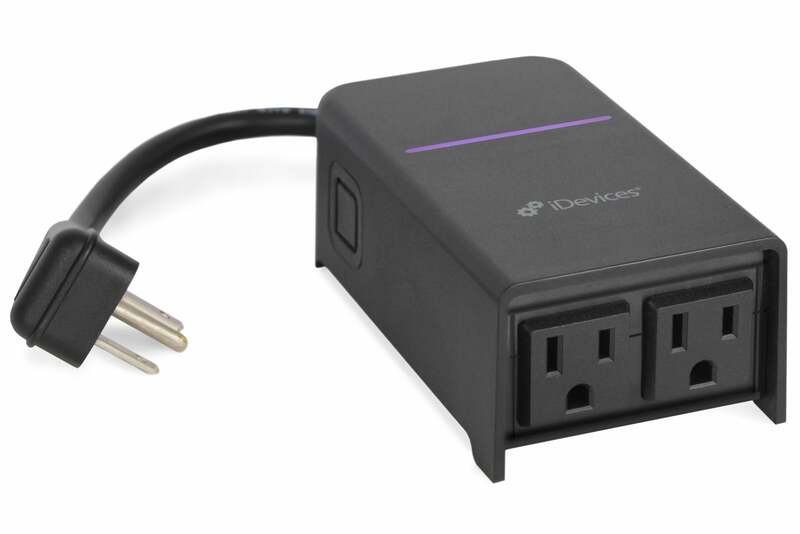 As with other iDevices gear, the Outdoor Switch is premium-priced at $49.95 (at the iDevices store), a significant upcharge over competing units, which tend to run $25 to $35. The second outlet does add some valuable flexibility, though—as does the comfort of knowing that this outlet will work perfectly when you plug it in. This story, "iDevices Outdoor Switch review: A premium smart outlet you can use in the yard " was originally published by TechHive.